Tickets for Bowlus Main Auditorium events are for reserved seating, unless otherwise noted. The auditorium features continental seating with generous aisles and plenty of leg room. A ramp entrance is available on the WEST side of the building for those who may have difficulty navigating the front entry stairs. Wheelchair seating is reserved on either side in the front (Row AA) or along the back behind Row M. Please be aware that there is no elevator access to the balcony. The Bowlus Main Auditorium seats 742 guests; 461 on the orchestra level and 281 in the balcony. 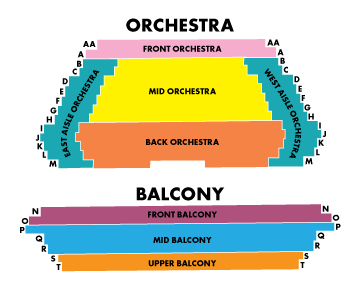 The front of the balcony is positioned over the Back Orchestra section of seating. The Dale P. Creitz Recital Hall is located on the lower level of the building's east wing. Patrons should enter via the EAST or SOUTH (alley) doors for Creitz Recital Hall events. A chair lift is available at the EAST door for those who are unable to navigate the stairs. The Creitz Recital Hall seats 120 guests for performance events. All seating is general admission. Advance tickets to Bowlus Cultural Attraction Series and Creitz Recital Hall Series events may be purchased online! Guests may also call the Bowlus Office at (620) 365-4765 or visit us through the SOUTH (alley) entrance at 205 E. Madison Ave. in Iola, Kansas. Office hours are Monday through Friday from 8 AM - 4 PM. Any remaining tickets will be available for purchase at the door. 1) Pay it forward and give your tickets away to a friend or family member! 3) Return your tickets to the Bowlus Office or to the Box Office in the main lobby the night of the show. The Bowlus can not refund your money, but we can help find someone happy to use your ticket(s). For tickets returned 48 hours prior to the event (or by 4:00 p.m. the Wednesday prior to a Saturday evening show), the Bowlus will accept the tickets as a charitable contribution and provide a receipt (total to include purchase price plus sales tax paid) which can be used for tax purposes. Advance tickets to events sponsored by other users of the building are available directly from the sponsoring organization. Please refer to the specific event on the BOWLUS CALENDAR for more information on purchasing tickets for other user events.